It is with great urgency that we humbly request your donations towards our cause. Cyclone Gaja made landfall on November 15. The economic impact of this cyclone is comparable to the Tsunami of 2004. Impacted communities are struggling for day to day survival. 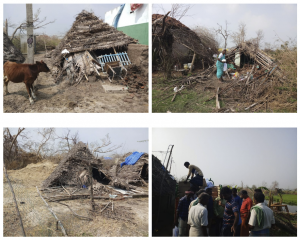 The trauma of experiencing a cyclone with 95 miles per hour winds and its aftermath has been unimaginable for many villages. Homes do not exist anymore, water sources are contaminated, electricity supply is still unavailable in numerous areas, and many towns and villages remain inaccessible due to fallen trees. Tamil Nadu farmers contribute a quarter of India’s coconuts and today, 60% to 80% of these coconut trees in the region has been destroyed. The livelihood of hundreds of farmers is at stake as it can take numerous years to reestablish these coconut fields. There is immediate and long-term need that has to be addressed. Although the Indian government and some foreign agencies are providing aid, there is still a great need. We have reached out to family and friends who are currently helping in impacted areas and have informed us that there is an urgent need to provide Tarpaulin (tarps) and bedsheets (Sathangudi & Kannanthangudi – 614625, Thiruvarur District, Tamil Nadu, India) as the first phase (immediate need) of helping families. We are also in the process of identifying farmers and their families in villages who have become destitute as a result of Cyclone Gaja. It is this time of the year when we are all digging deep into our pockets in the week of giving. We humbly seek your contributions to begin to meet the unrelenting needs of the people most impacted by Cyclone Gaja. The above relief efforts will be executed by our volunteers.